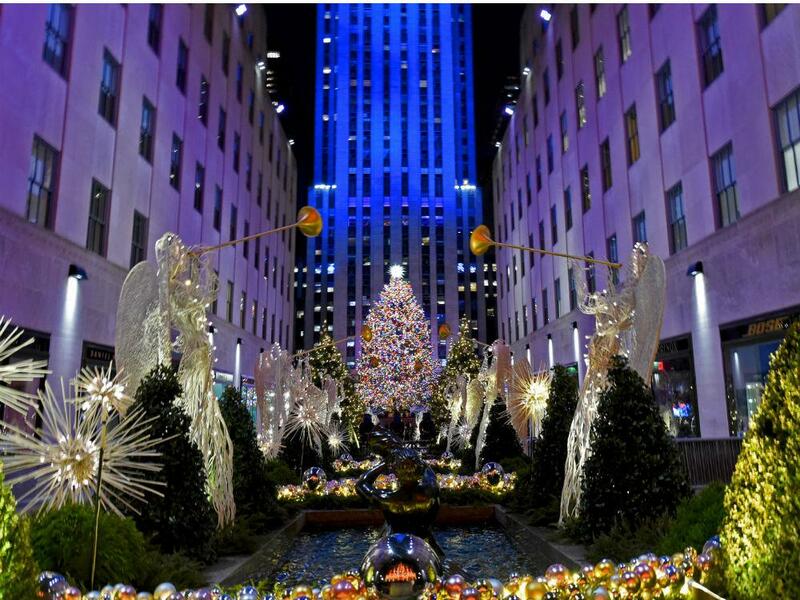 With the lighting of the Rockefeller Center Christmas Tree last Wednesday night, the holiday season arrived with a flourish in NYC. See the gorgeous 72-foot-tall Norway spruce at the Plaza through January 7. While you're setting your sights high, make a reservation for the fabulous Rainbow Room brunch, returning for a special holiday engagement. The legendary venue on the 65th floor of 30 Rock will be serving luxurious dishes, drinks and desserts on three Sundays: December 9, 16 and 23. Reserve here. For a yuletide treat that's absolutely free, catch the 45th Annual Merry Tuba Christmas at Rockefeller Plaza this Sunday, December 9, starting at 3:30pm. Right beneath the Tree, hundreds of brass musicians will play Christmas carols and other holiday classics while the audience sings the tunes. Also on the Plaza, the Rockefeller Center Holiday Truck is selling limited edition Christmas decorations, and hosting events including a silent disco (December 6, 8–10pm) and a family photo booth (December 11–12, 8–11am). See our roundup of best Xmas ornaments and our 2018 Holiday Gift Guide, and check out the newly relaunched FAO Schwarz to delight the kids. The Rink at Rockefeller Center is always a favorite, and you can reserve VIP tickets and skating and dining packages to beat the lines and make a full day or night of it. Also book breakfast with Santa followed by a spin on the ice. It's been a record-breaking season at Christie's, and there's still more excitement on the way. As part of the Christie's Lates series, the auction house will host a holiday bazaar in its Rock Center galleries on Monday, December 10, 6–8pm. Exhibitions, shopping and champagne round out a special evening. The Christmas Spectacular is in full swing, complete with its new drone-powered finale, and tours of Radio City Music Hall (which include meeting a Rockette) are running daily. The observation deck at Top of the Rock is an outstanding way to see NYC (with VIP access available), and the NBC studio tour is another hot ticket (open to ages 6 and up), which you can reserve here. Get a jump on planning for New Year's Eve. Ultra-fabulous parties are taking place at the Rainbow Room and Bar SixtyFive, with tickets available here. Finally, while it's a blast to indulge over the holidays, it's especially rewarding to give back. The 30th Annual New York Cares Coat Drive is currently underway, with bins in all the lobbies around Rockefeller Center collecting new or gently worn coats to help New Yorkers in need. The Coat Drive is running through December 27.